Umrah is such a terrific holy activity which can bring a huge positive impact on your life but surely, its impact on an individual varies from person to person. For some people, they may find their whole life changed after performing an Umrah and they experience a huge positive impact on their entire life once finishing their Umrah trip. On the other hand, there may be a few people who find very little or no impact on their lives as a result of performing an Umrah. There are several factors which play a significant role in determining the impact of performing an Umrah. These may include the purity of your belief, your actual intention behind going for an Umrah trip (if you have performed an Umrah purely for making Almighty Allah happy, you can expect a lot of blessings and a good overall impact on your life but if you have gone for an Umrah trip just for outing or impressing other people, you can’t expect a positive outcome from your Umrah trip), the number of good deeds you have performed during the whole Umrah trip, how much you refrain from sins, how you are intended to spend the rest of your life after coming back from the Umrah trip and so on. 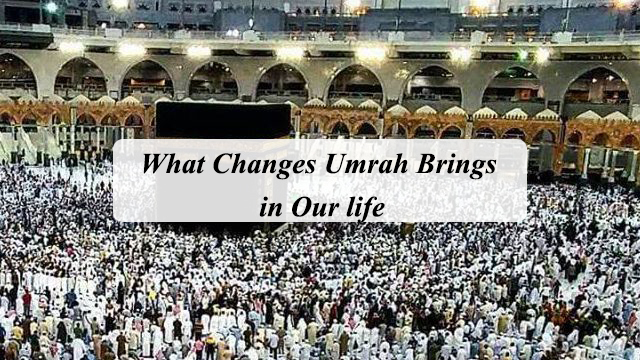 Based on various such factors, the impact of Umrah on your life is determined. Umrah, worship and remembering Almighty Allah in abundance can have a terrific impact on your heart and can lead to much more pure and sincere heart. A person should focus on performing an Umrah in such a way that he or she is be doing as many good deeds as possible during the whole Umrah trip and remembering Almighty Allah as much as he or she can. If an Umrah is performed in such a way, a person can expect to have a huge positive impact on his or life as a result of performing an Umrah. It is said that our actions are determined largely by our heart. If the heart is pure, we will be doing the right deeds but if the heart is sick and rusted, we are more likely to remain to indulge in evil deeds and will be performing very little or no good deeds. Therefore, a person must try to improve the condition of his or her heart by remembering death, reciting Quran, remembering Almighty Allah in abundance and keep on admitting that there is no God but Allah. While performing an Umrah, a person has to spend some time with the Muslims who came from all parts of the world. All these Muslims despite belonging from variable locations and cultures, spend time together in a much peaceful way because they have one thing in common and that is their religion. They all are following the same religion which declares them all as brothers. This gathering for performing an Umrah gives rise to the feelings of brotherhood in one’s heart for all the Muslim. For the Muslims who want to go to Makkah to perform the obligations of Umrah, we offer the best Umrah December Package Deals from the United Kingdom in affordable prices. ← How To Select Best Travel Agency For Umrah?